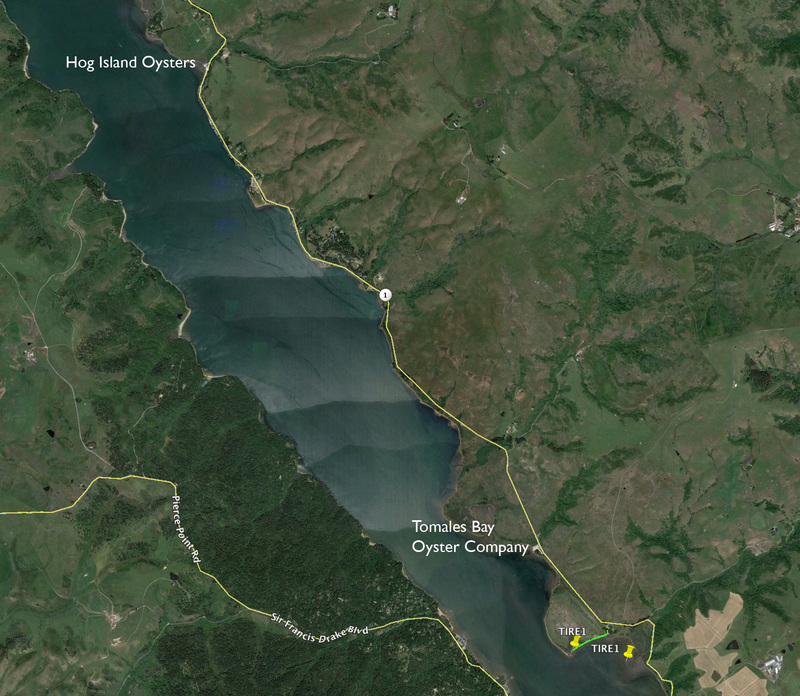 Save our Tomales Bay – part 13.2 Hog Island Oysters gets it done! 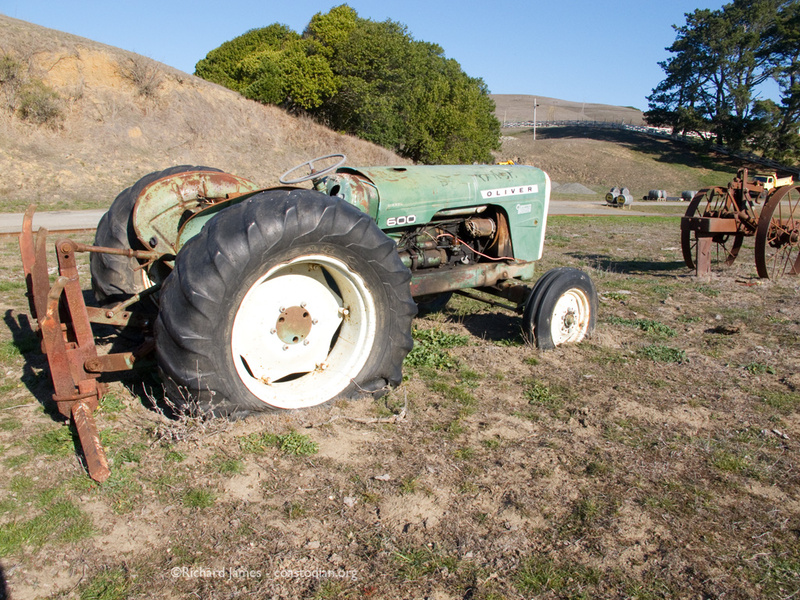 The folks up at Hog Island saw my recent going on about the bumper crop of tractor tires spoiling the beauty of Tomales Bay near Millerton Point. They went down this morning, Zane Finger and one other and pulled out 6 tires between them. 5 Big ones and 1 auto-sized tire. See below what two experienced water-workers can get done in short order. 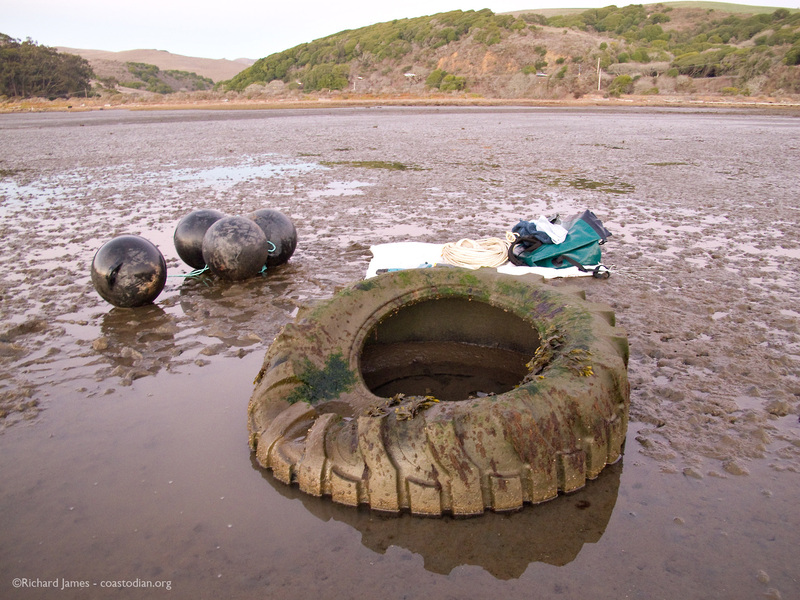 Two workers from Hog Island Oyster Company drove to Millerton Point on 20 January, 2014 and recovered six discarded tires from Tomales Bay. 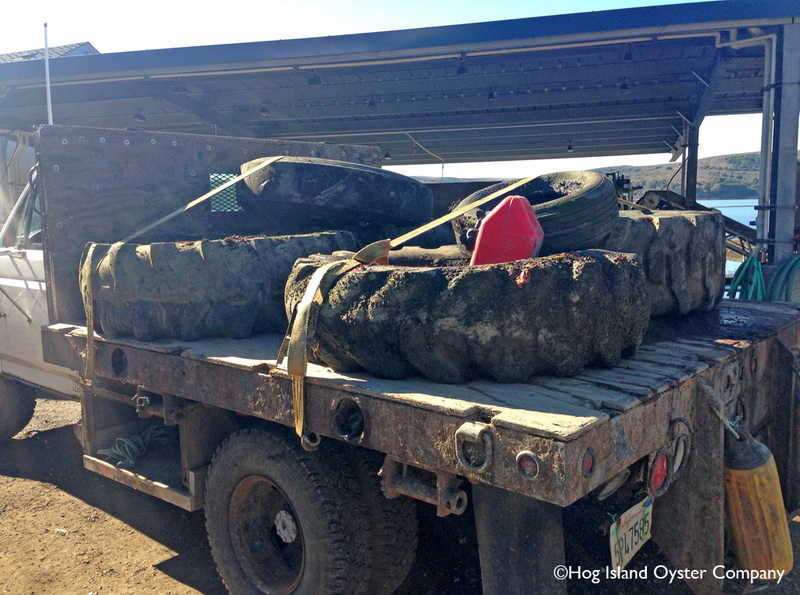 Huge thanks to Hog Island Oysters for coming down from Marshall to get these tires from a hopefully bygone era of thoughtless discarding of items no longer wanted. Lower right of this image shows where I attached the floats (yellow pin to the right) and where it drifted with the high tide the next morning a third of a mile away. 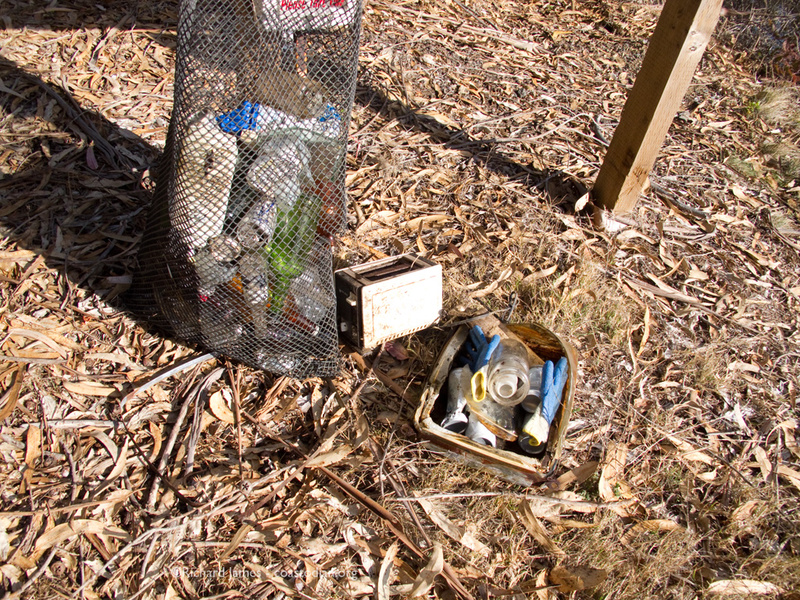 Kudos to Hog Island Oysters for taking a leadership role in cleaning up their oyster debris, as well as the errant trash of others. 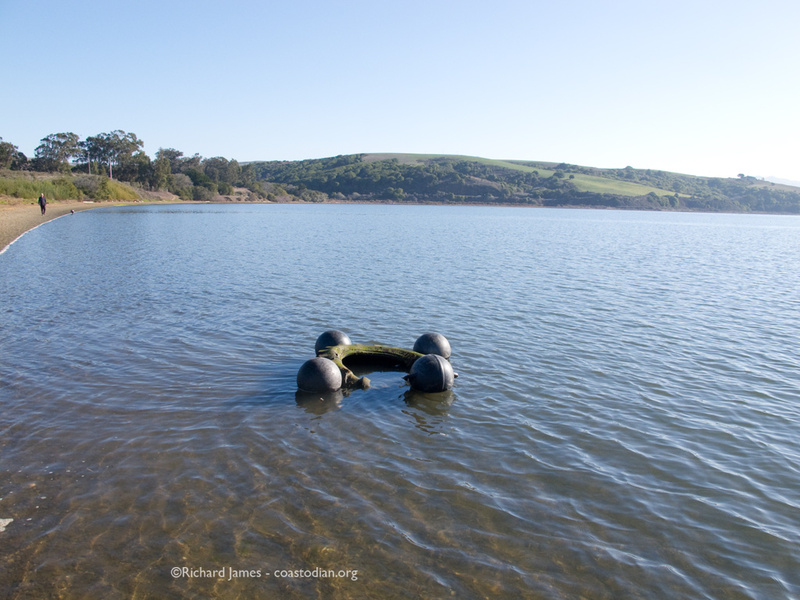 See the short video below for how much work it is for one less experienced water worker to get 1 large tire out of Tomales Bay. Next installment of this series may be found here. 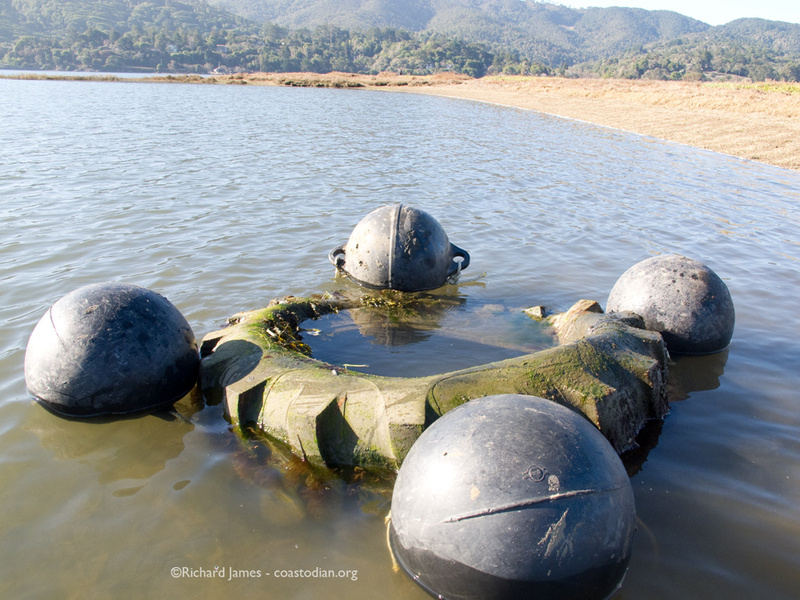 Save our Tomales Bay – part 13.1 Tractor tire floats! 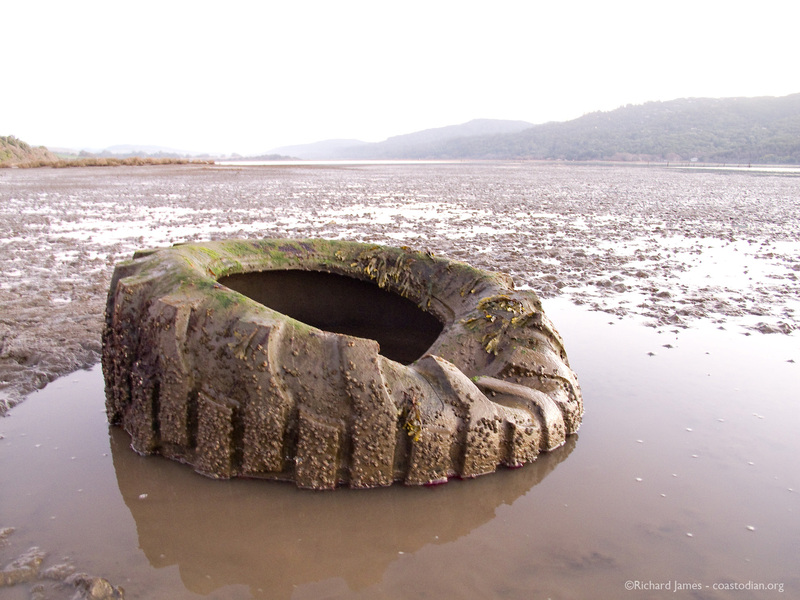 The tire drifted and made landfall on the beach at Millerton Point about a third of a mile WSW. 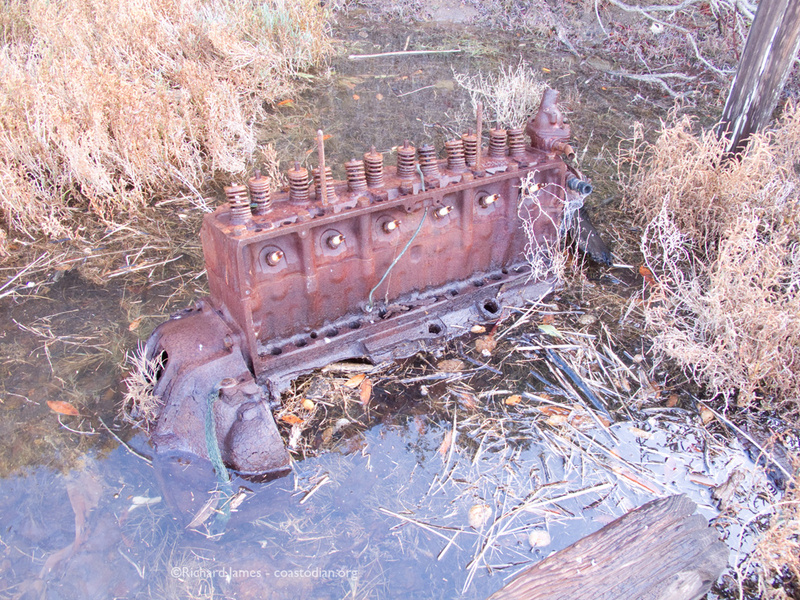 Now to get it to the parking lot at Millerton. Click on the words “DBOC Denied. 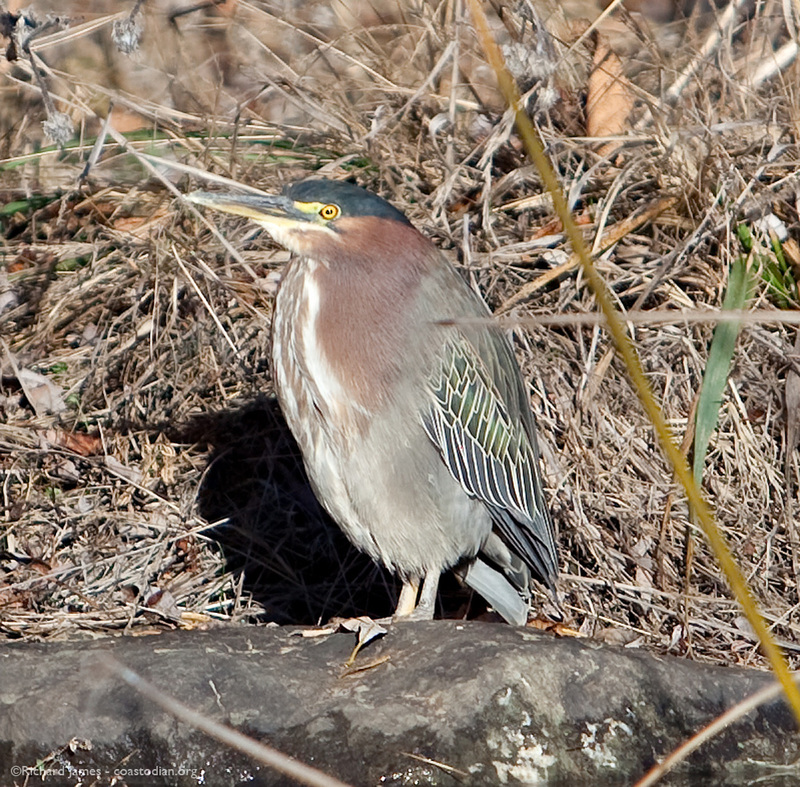 Nature Affirmed!” to see this post in its entirety. 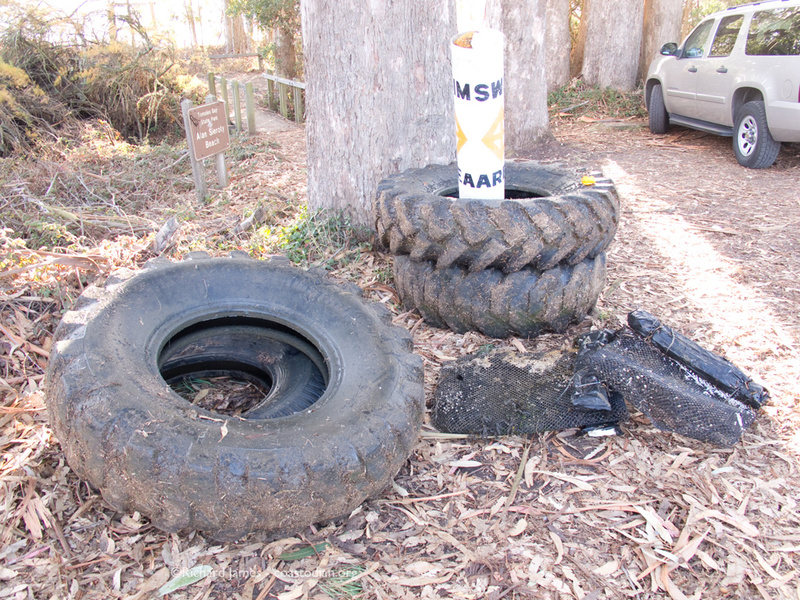 Seeing tires in Tomales Bay makes me sad. Seeing them in any body of water makes me sad. 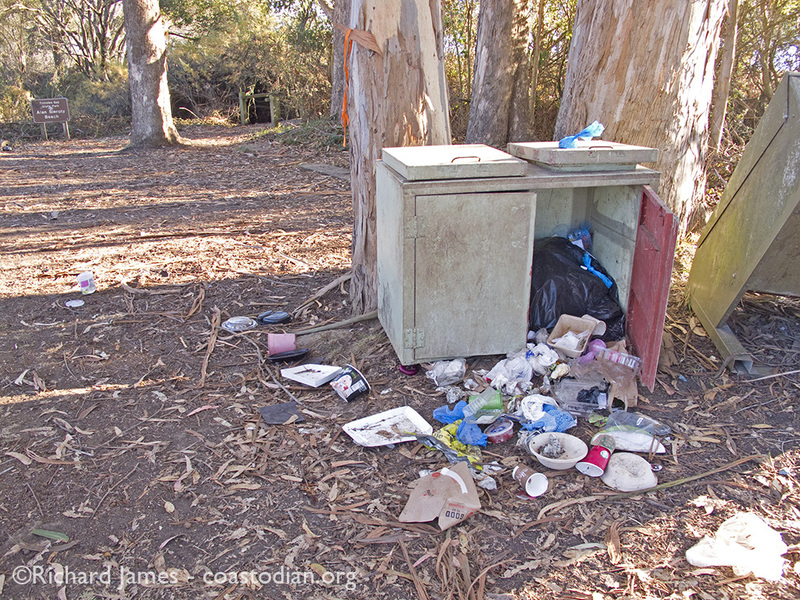 That humans can be so selfish to think it is ok to dispose of their trash in our collective treasures such as Tomales Bay is deeply troubling. After posting about pulling four tires out of the muck (with some help, TYVM), I received some notes from readers. 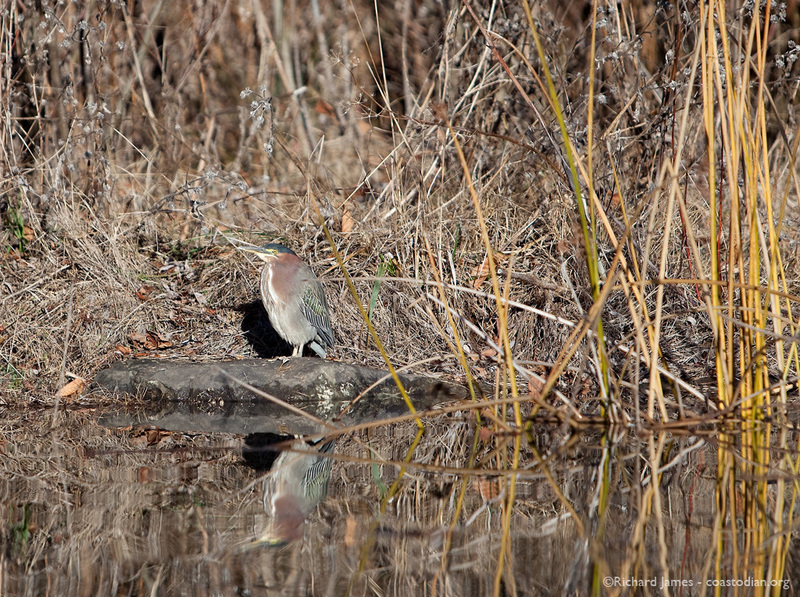 One from a person that works to eradicate non-native plants from our waterways. She told of seeing untold amounts of trash in SF Bay as she does her work. 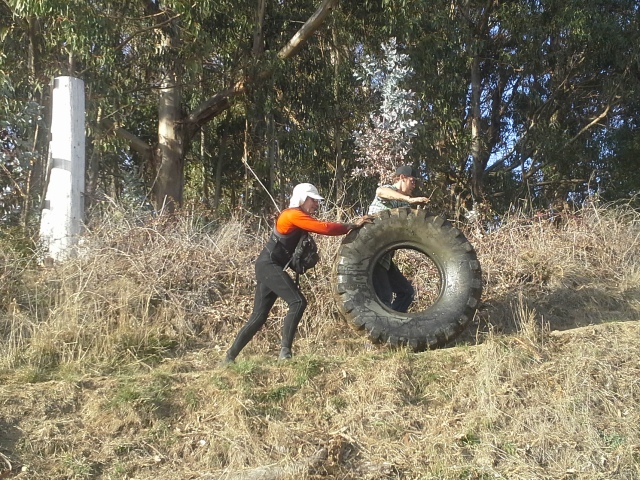 Another from someone that works in San Rafael and wanted to know of any tips I had for pulling tires from the muck. My tire knowledge is all learned on the job. Pull up a chair and see my latest idea. Not far from the most recent tires I recovered (read about that here), I found 8 more strewn about the landscape. Most of them in the muck of the bay, some close to shore. All huge tractor tires, bigger than those found on an 18-wheeler. 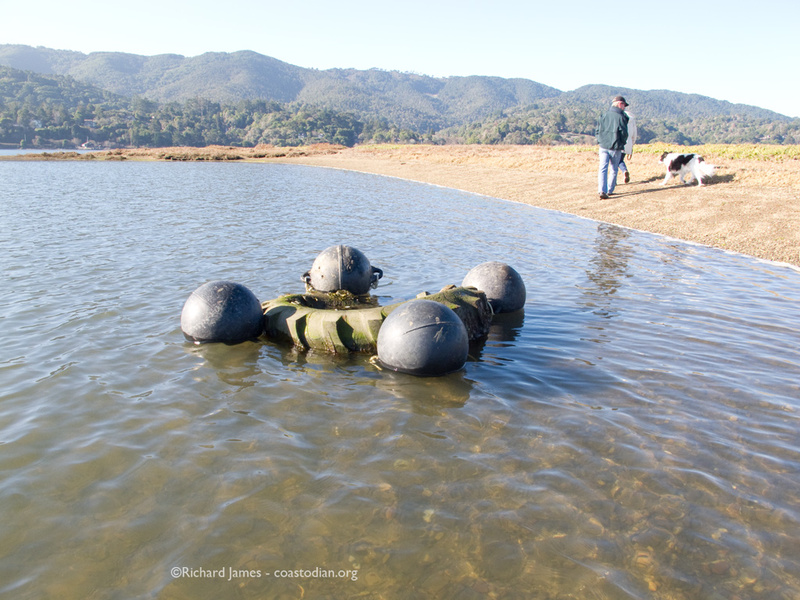 I did not want to wrestle those out of the mud, to the shore and up the hill to where park officials could take over to get them to a more suitable place. After some thought, I was reminded of my time building foot-bridges in Ethiopia. We had to use what we found on site in the form of sand, water and rocks when we mixed concrete for foundations. The sand was usually dug out of the river we were bridging. Yet, it was very muddy, and muddy sand makes for weak concrete. So we had to wash it. 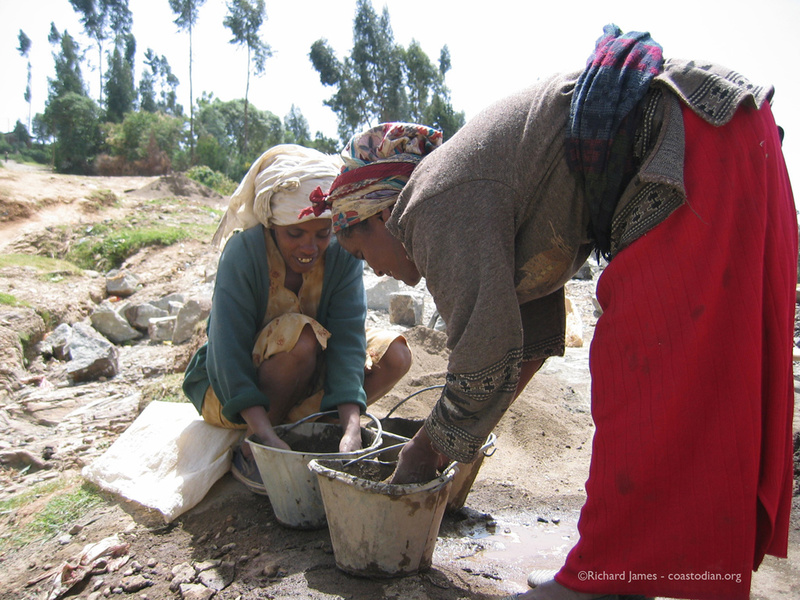 With two languages (English and Amharic) as a barrier, explaining the need to wash the sand was quite a task. Initially the locals were moving the sand to an area, washing it, then moving it to where we mixed it with gravel. Very inefficient. After doing it the hard way for too long, I came upon an idea to reduce movement of dirty sand and wash it in place, in the river. 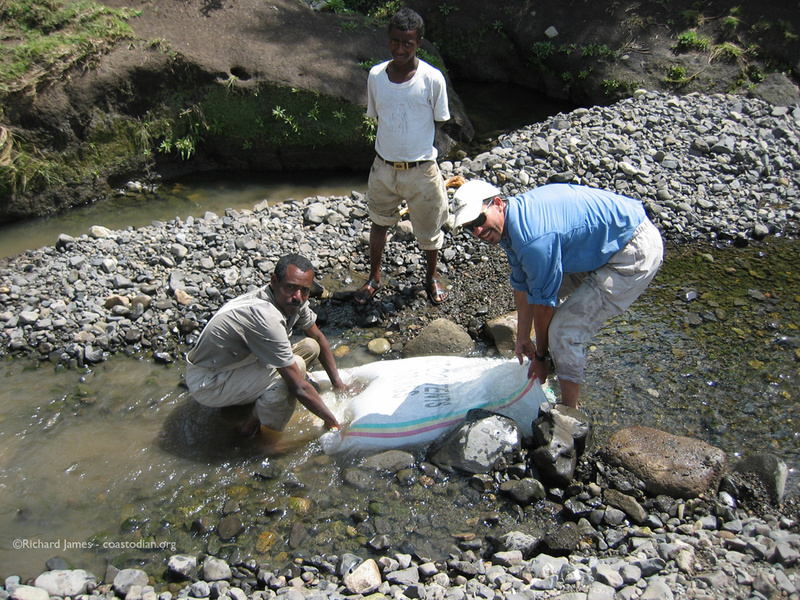 I later had someone make some teaching aids in Amharic, one of them read “Let the water do the work“. 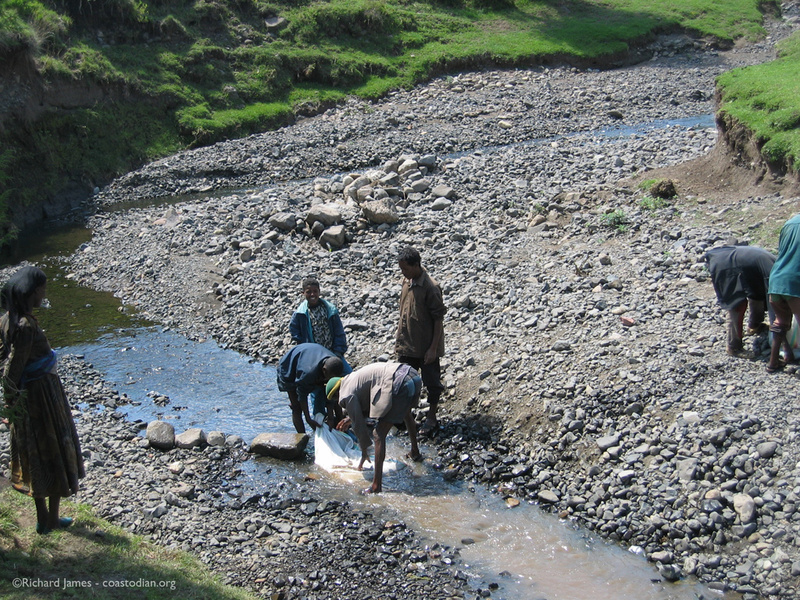 Ethiopians washing a bag of sand in the river. When heavy rains come, this trickle turns to a torrent. Many lives are lost attempting to cross to get to school, market, clinic. Marye, Ethiopia. 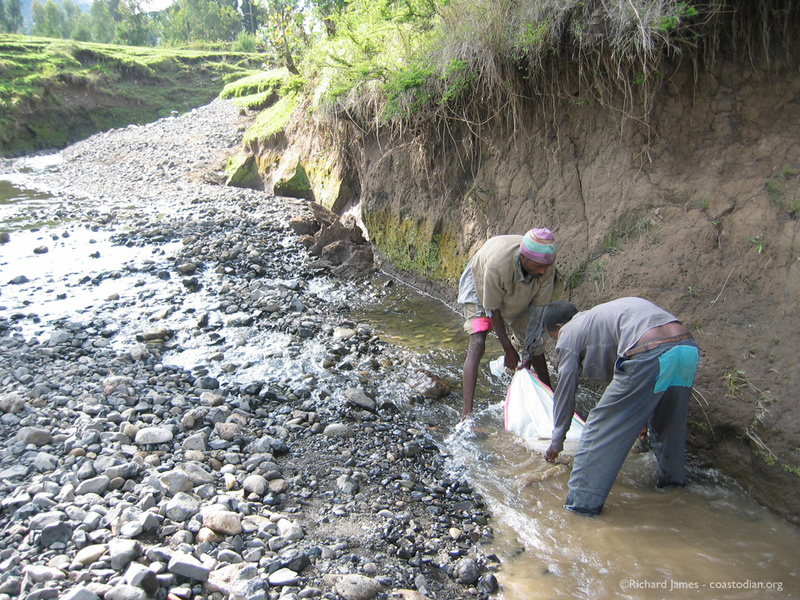 Ethiopians (and one yank) washing a bag of sand in the river. When heavy rains come, this trickle turns to a torrent. Many lives are lost attempting to cross to get to school, market, clinic. 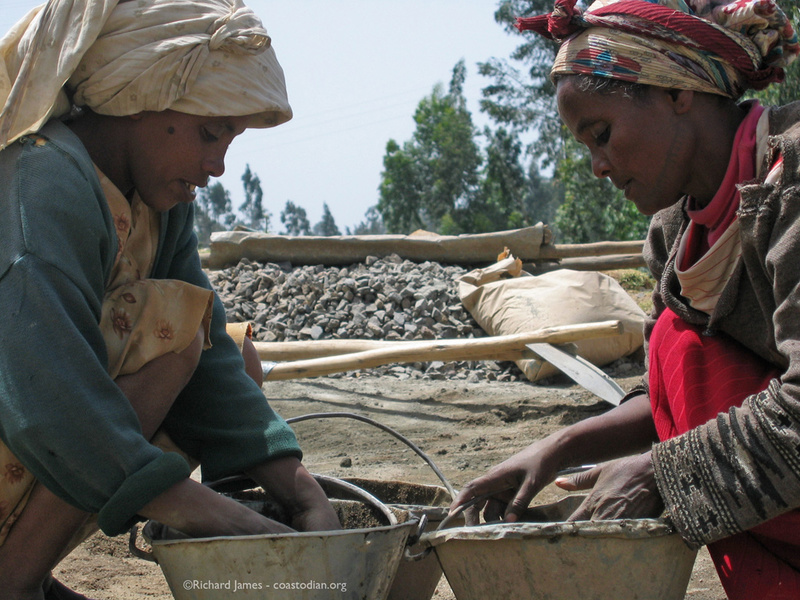 Marye, Ethiopia. 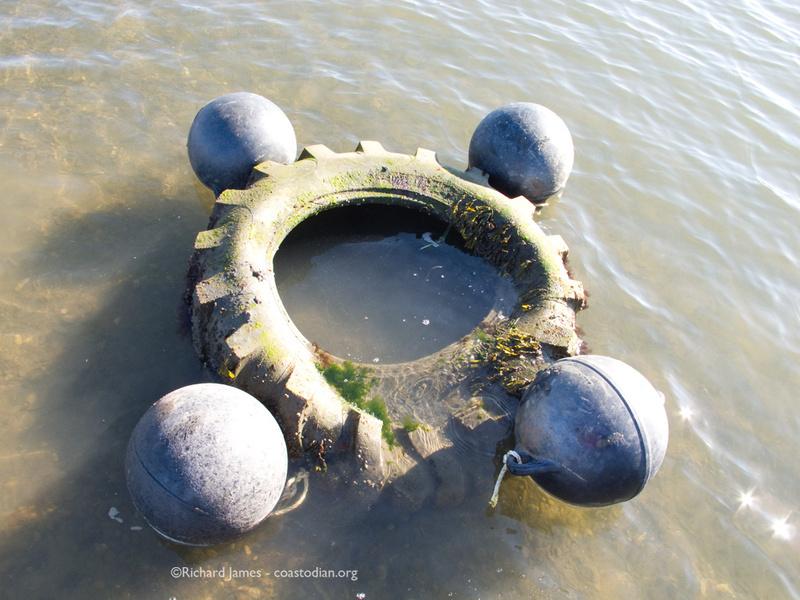 With these memories in mind, I had an idea to let the water do the work with these tires. I collected 4 large plastic fishing floats I had gathered off the outside beaches of Point Reyes, crab fishing rope from the same area, and a plastic trowel, again collected from the beach. Along with these items I packed into a dry bag a portable electric drill, 4 batteries (my drill is old and the batteries don’t hold much charge), a 1/2 inch bit, a headlamp, towels, gloves and a knife. With all of the above stowed in or on my scow (what I call my kayak), I paddled over to Millerton Point as both sun and tide were dropping. Two tires came into view and I picked one to test my idea on. After carrying my tools across squishy, sticky mud to the tire, I walked back 100 feet to my scow and pulled it further away into deeper water to tie to a post from an old oyster fence. Having learned the hard way doing work during a dropping tide, I knew if I left my boat near the work-site, I’d be dragging it a hundred yards or more to water deep enough to float. 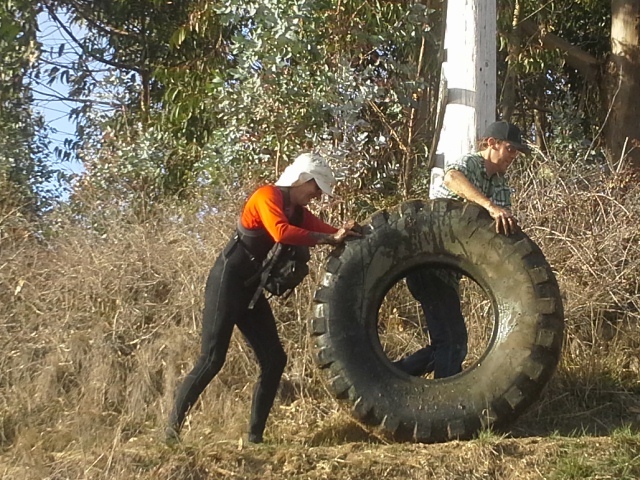 Using the drill, I bored two holes in four locations and secured the floats to the tire. With my found trowel and bare hands, I then scooped probably 70 pounds of horribly stinky mud out of the tire to help it float. 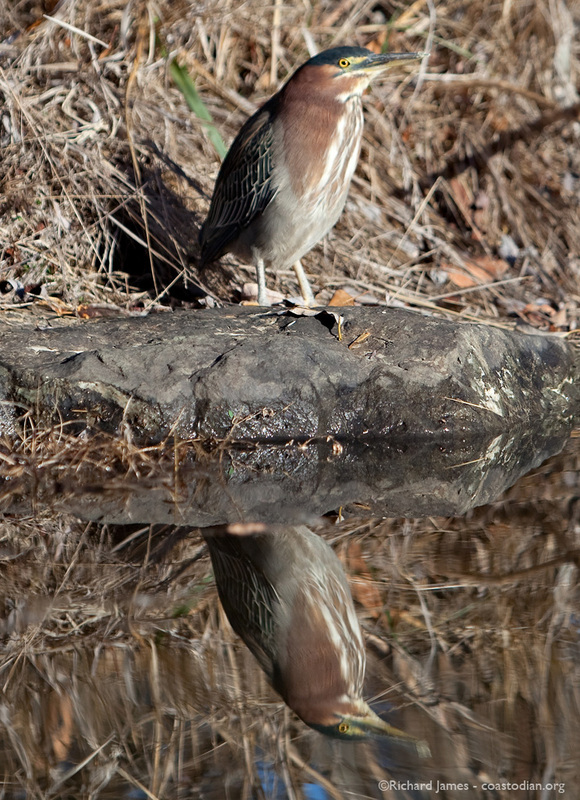 You can see some of the mud in the foreground of the last image with the floats attached. 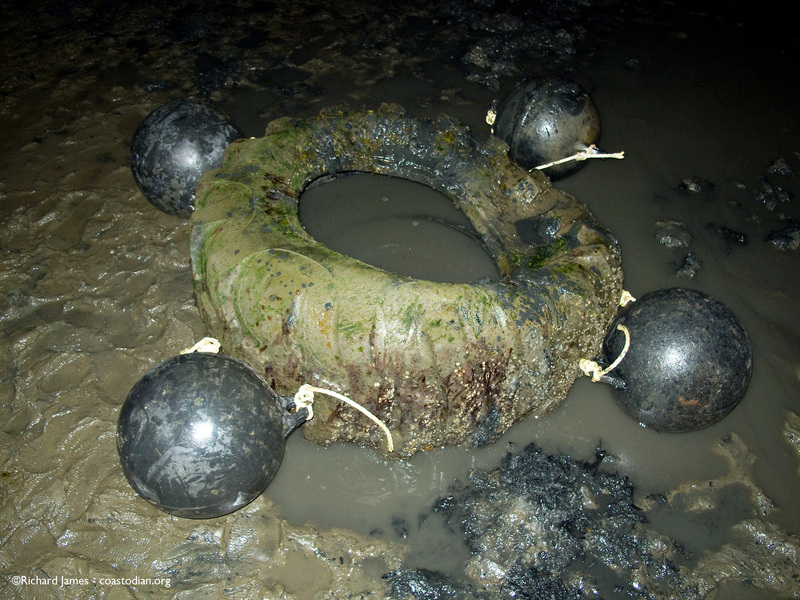 I’ve no idea if these four floats will float the tire and allow it to be brought to an area for extraction. I hope the water will do the work and will go out tomorrow to see if the tides pushed this test tire away from where it has likely sat for many years. If you want to see some bridge building, go here to visit the website of the NGO I volunteered with. 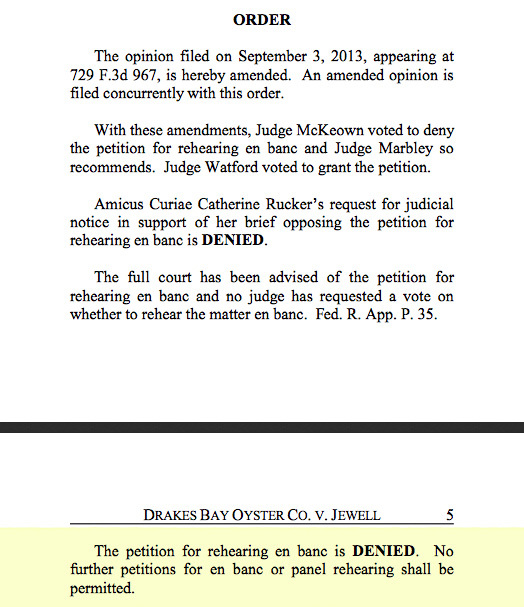 Today the ninth circuit denied the appeal for a hearing en banc to allow Drakes Bay Oyster Company to continue to ignore their expired lease to extract money from Drakes Estero in the form of oysters and clams. The entire amended opinion may be seen here.